him to come to church with him. It was that Sunday that Goodman felt the Lord’s presence during the sermon. Down the aisle with his buddy in tow, he gave his life to the Lord. “It was the best day of my life. From then on, I just wanted to get involved with what the Lord was doing, whatever it was,” said Goodman. Since then, Goodman has sought various ways of getting involved with the Lord’s work. Of all the different avenues to serve, he always found that gardening came the most naturally. Goodman especially loved flowers – any kind! When he wasn’t working in other people’s yards, he was pruning his own garden. Through the course of time, it became a given that Goodman would go into some kind of landscaping and maintenance work as his profession. 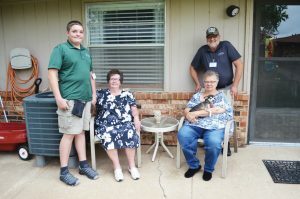 Even after studying horticulture, he never dreamed he would find himself living in and working at Baptist Village of Oklahoma City (BVOKC), especially in the capacity that he currently does. 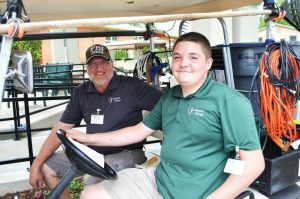 Every weekday morning, Goodman gets up, throws on his work clothes, hops on the maintenance golf cart and works until noon. His primary responsibilities consist mostly of maintenance and landscape care. one. He lives out Baptist Village Communities’ (BVC) goal of serving God, serving you and serving together. When getting to interact with residents, Goodman often finds himself extending invitations to the on-campus church services or even praying for them. During the summer, Goodman’s trusty 14-year-old sidekick Austin Knutson joins him on his tasks. Knutson’s mother serves as a nurse for Entrusted Hearts by Baptist Village, the on-campus licensed home health agency. A year ago, she came to know Goodman and asked if her son could join him in volunteer maintenance during the summer. Since then, Goodman has led Knutson to the Lord and even witnessed him getting baptized in the pool on campus. 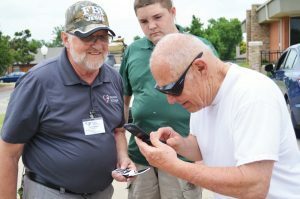 “He’s become like another grandson to me,” said Goodman. Last Summer Goodman got to lead his 14-year-old maintenance sidekick to the Lord. Knutson is one of many people who come to BVOKC and is impacted by Goodman. 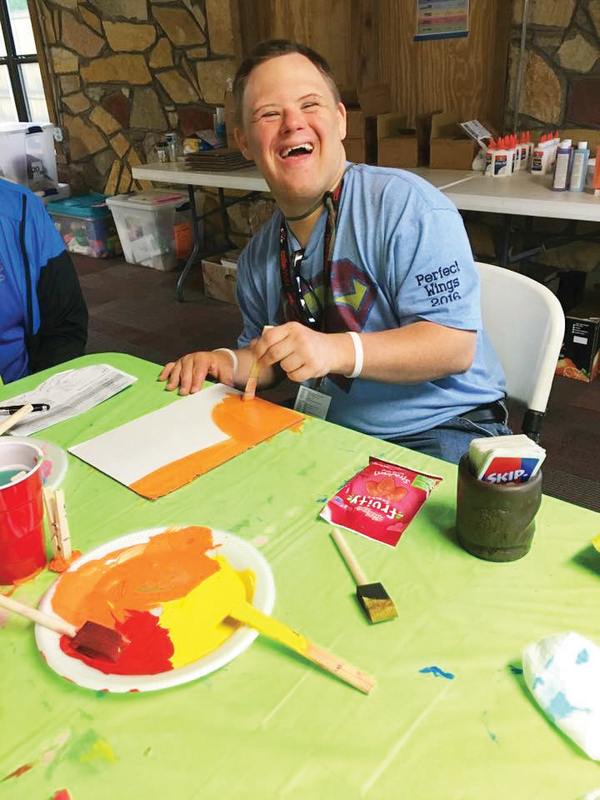 Be it as a summer volunteer, a resident or Friends Team member, Goodman always seems to make an impression. His infectious laughter and contagious smile brings joy to everyone he meets. He’s not afraid to get his hands dirty either in the garden soil or in the hardships of his friends in the community. Many at BVOKC would agree that Goodman is simply a good man bringing the good message of the Gospel. View more articles by Hannah Hanzel.